On special, we are offering a mini pan of Quiche Lorraine with a cup of our soup of the day and our mesculyn, walnut and gorgonzola salad. For those of you who are unfamiliar with this dish, quiche is most easily described as an open faced pie or pastry dish that is filled with a savory custard filling, meat, cheese and vegetables. Quiche itself is considered to be French. Its origins can be seen in English cuisine dating back to around the 14th century. There are many different variations of quiche depending upon what type of meats, cheeses and vegetables are used. 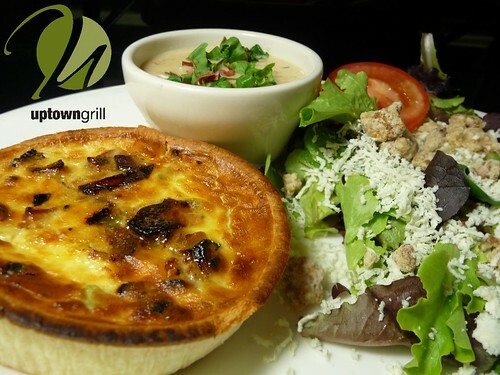 We have chosen to serve our own variation of a traditional Quiche Lorraine made with applewood smoked bacon, gruyere cheese (a delicious French cheese with a strong yet sweet taste) and caramelized onions. Made fresh daily, you can't miss with this quiche! Give it a try while it lasts!